Zimbabwe’s government has a trust problem as it introduces a discounted currency in a bid to reverse chronic cash shortages that left people struggling to get hold of basic goods. Business people and economists welcomed last week’s decision to abandon an unrealistic dollar peg for the country’s surrogate bond notes and electronic dollars, which were merged into a new currency called the Real Time Gross Settlement (RTGS) dollar. But they expressed doubts about whether the government has the fiscal and monetary discipline to stick to its commitment to lower the budget deficit and keep inflation in check. “There is nothing to stop Zimbabwe printing money with this new currency,” said Jee-A van der Linde, an analyst at South Africa-based NKC African Economics. Zimbabwe’s currency woes have undermined President Emmerson Mnangagwa’s efforts to win back foreign investors who were side-lined under his ousted predecessor, Robert Mugabe. The last time Zimbabwe had its own currency, a decade ago, Mugabe’s government was able to turn on the printing presses to fund higher salaries for government workers, curry favour with the military and pay political opponents – with disastrous economic consequences. Residents of the capital, Harare, now wait outside banks for hours to withdraw a maximum of around $30 in surrogate money or collect remittances from relatives abroad. Snaking queues have become the norm at petrol stations because of a shortage of fuel. 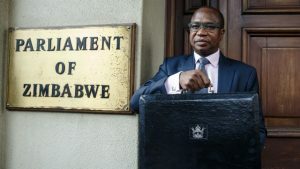 Finance Minister Mthuli Ncube last week pledged to contain public spending and reiterated the importance of the independence of the central bank. Yet, investors and Zimbabweans remain concerned that, should Mnangagwa’s government come under political or military pressure, it may revert to the tricks of the past. Some also fear that the Reserve Bank of Zimbabwe (RBZ), the country’s central bank, will be unwilling to loosen its grip over the currency as its governor, John Mangudya, is thought to oppose the move to abandon the dollar peg. “It’s quite clear that the minister of finance wants a liberalised currency regime, whereas the governor of the Reserve Bank doesn’t,” said Eddie Cross, a Zimbabwean economist and former opposition lawmaker. Whether Zimbabwean policymakers can convince their doubters, both in financial markets and on the streets, will be central to the success or failure of the new RTGS dollar. If Zimbabweans begin to use banks instead of the black market to exchange any U.S. banknotes they have stashed under their mattresses, then the government could start to rebuild its foreign currency reserves by buying those dollars from banks. That could give it the wherewithal to re-launch the Zimbabwean dollar when the economy has turned a corner. Zimbabwe ditched its own currency for the U.S. dollar and other currencies in 2009, after hyperinflation reached 500-billion% the previous year. But as a chronic hard currency shortage worsened, it introduced a parallel system of bond notes and electronic dollars, nicknamed “zollars.” The substitute currencies were pegged at 1:1 to the U.S. dollar but traded at a discount on the black market. A key test for the RTGS dollar comes on Monday, when many Zimbabwean banks will buy and sell RTGS dollars on the inter bank market for the first time. Some large firms will also be able to buy foreign currency from banks, but it is not clear how much or on what terms. Many Zimbabweans are skeptical that the latest monetary intervention will reverse the crisis. “The government has changed things over and over again, “said Godfrey Chinani, who is worried that customers will no longer be able to afford the car parts he sells from a cramped shop in downtown Harare. He wishes Zimbabwe had switched to the rand instead, as he buys his goods mainly from South Africa. The central bank sold U.S. dollars to a handful of banks at around 2.5 RTGS dollars on Friday, an effective devaluation of 60%. More than $5-million changed hands on the inter bank market, a senior RBZ official told The Standard newspaper. In the coming weeks, the new currency is expected to weaken towards 3.5 to the dollar, the level at which bond notes have been trading on the black market. Many Zimbabweans fear a return to the hyperinflation era that prevailed during part of Mugabe’s tenure if the RTGS dollar sinks much beyond that point. Inflation already hit a 10-year high of 57% in January, and some public servants say the currency devaluation means the government should raise their salaries by several times. Authorities have pledged to control the currency’s slide as part of a “managed float,” but how they intend to do that remains a mystery. The central bank said last week it had secured “sufficient lines of credit” to launch the RTGS. Analysts are scratching their heads as to where the money could have come from. Informal currency traders in downtown Harare said they were waiting to see how the new currency trades on Monday before they change their rates. Analysts say one way for Mnangagwa to build confidence in his economic reforms would be to try to mend a deep political rift with the country’s main opposition party, the Movement for Democratic Change (MDC). Mnangagwa narrowly defeated MDC leader Nelson Chamisa in an election last year which the opposition says was rigged but which Mnangagwa says he won fairly. A violent security crackdown on post-election protests and on demonstrations last month against a major fuel hike have hardened international attitudes towards Mnangagwa’s government and deterred much-needed investment. “An economic solution on its own, without being backed by apolitical solution, won’t take us to sustainable economic development,” said Eldred Masunungure, a politics professor at University of Zimbabwe. The post Zimbabwe struggles to convince doubters as it launches new currency appeared first on SABC News – Breaking news, special reports, world, business, sport coverage of all South African current events. Africa's news leader..